With Week 1 of fantasy football behind us, and finally some fresh stats to analyze, I’m here to help you with your toughest start/sit decisions of the week. Note: If you don’t see one of your players mentioned below, please refer to our rankings. Conner played on 100 percent of the team’s snaps and led the league in touches in Week 1. While Le’Veon Bell has arguably been fantasy’s most valuable player since 2015, his back-up has averaged 22.0 fantasy points per game across the 16 games he’s been inactive over this stretch. Conner is a lock and load must-start RB1 moving forward. Since 2014, including the postseason, Roethlisberger averages a whopping 24.0 fantasy points per game at home and only 14.7 fantasy points per game on the road. He’s playing at home this weekend and Pittsburgh has the third-highest implied point total of the week (28.5 points). He’s a top-five fantasy quarterback this week. Yes, even in shallow leagues, Kittle is an easy top-six tight end this week. He totaled 90 yards on nine targets in Week, 1 benefiting from a Marquise Goodwin injury (he played on only 25 percent of the team’s snaps) and Pierre Garcon drawing shadow coverage from Xavier Rhodes. Kittle’s Week 2 matchup looks almost identical to Week 1, but might even be a little better. Goodwin is still seriously banged up, Darius Slay is then likely to shadow Pierre Garcon, and Detroit’s defense just let the youngest starting quarterback in NFL history drop 48 points in his first career game. After a dominant preseason (in terms of both usage and performance), Sanders kept the train rolling in Week 1, posting 29.5 fantasy points on 11 targets. This week he’ll run the plurality of his routes against Leon Hall, who graded 14th-worst of 131 qualifying cornerbacks last year. I have Sanders as a fringe-WR1 this week, and a few spots ahead of Demaryius Thomas. Last week Peterson saw 26 carries, three targets, and all of the team’s three running back opportunities inside the 10-yard line. That’s rock-solid RB1 volume. It’s doubtful volume will be this good every week, but it should be nearly as good this week. Washington is favored by 6.0 points against an Indianapolis defense that allowed the fifth-most rushing fantasy points to opposing running backs last year and just surrendered 25.9 fantasy points to RB Joe Mixon in Week 1. If I owned Freeman in a medium-sized league, I’d be panicking – and I surely wouldn’t be starting him. He amassed just 29 percent of the team’s running back expected fantasy points in Week 1 and was out-touched by fellow rookie Phillip Lindsay. Perhaps his Week 1 usage was an aberration, but I’ll need him to see him take on a bigger workload before considering starting him again. 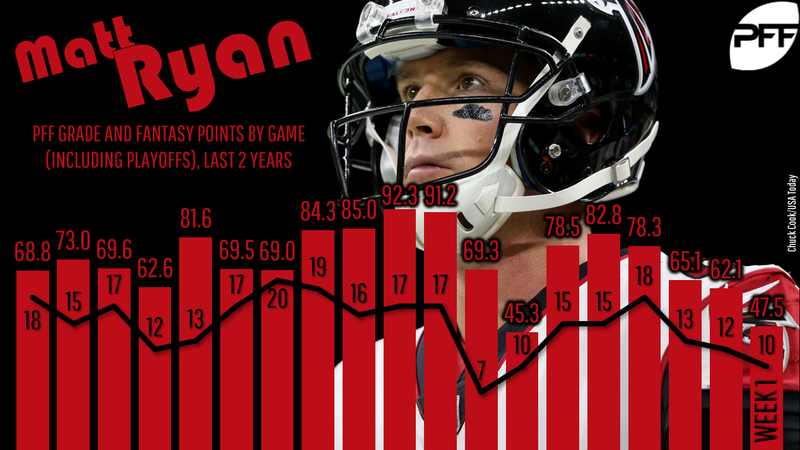 Ryan looked atrocious, or at least very rusty, in Week 1. He finished the week as our fourth-worst-graded quarterback of 35 qualifiers. Granted, Philadelphia has a tougher pass defense than Carolina, but still, I’m cautiously pessimistic and having an easy time finding better values this week. Los Angeles likely has the league’s best cornerback corps, sporting three starting cornerbacks who all graded out top-20 a season ago. It’s not yet time to panic on Cooper, but I’m not sure it’s time to start him. This week he goes up against a Denver defense (at home) that surrendered the second-fewest fantasy points to opposing wide receivers last year. Only once since the start of last season did a team combine to hit 100 rushing yards or more than one rushing touchdown against Minnesota. In total, running backs have averaged just 3.56 yards per carry against them over this stretch. Williams averages just 3.59 yards per carry throughout his career. He’s not in play for me this week. Gordon scored in Week 1 but was also out-targeted 15 to three by Jarvis Landry. I think Gordon’s full-season prospects still look as rosy as ever but I’m wary this week. I suspect he might be sluggish to start the year, as Landry has a more cemented rapport with Tyrod Taylor, after Gordon was missing in action for most of camp. On top of that, this week, Gordon projects to be shadowed by New Orleans’ cornerback Marshon Lattimore. Lattimore struggled in Week 1 but I’m more focused on the larger sample of work – Lattimore was our No. 8-graded cornerback in 2017. If Rex Burkhead sits out with a concussion, White is a borderline must-start this week. Even if he doesn’t, White is still a terrific play. White tied TE Rob Gronkowski for the team lead in targets in Week 1 (eight) which followed up an impressive preseason, when White comprised eight of Brady’s 41 targets (19.5 percent). With injuries to fellow running backs Burkhead, Sony Michel, and Jeremy Hill, and the wide receivers up against possibly the best secondary in the league, this should help funnel volume towards White, as it did for most running backs against Jacksonville last year. A league-high 24 percent of Jacksonville’s receiving fantasy points allowed went to running backs last year. Davis is dealing with a minor hamstring injury, which makes this call a tad bit risky, though I still like Davis as a borderline WR2 this week. Delanie Walker’s injury should open up more volume – and it did in Week 1 when he ranked sixth among wide receivers in expected fantasy points. The matchup looks soft as well, up against our 25th-rated secondary in the Texans who also just lost starting cornerback Kevin Johnson to the IR. Like with Kittle, I’m not yet ready to buy into Cook as a fantasy TE1. I think it’s far likelier Los Angeles is just one of the softest tight end matchups all year. With three starting cornerbacks who graded out top-20 a season ago, targets should be funneled toward tight ends. Though, again like Kittle, I’m not sure that matters this week, in a near-identical matchup against a Denver defense that allowed the fourth-most fantasy points to tight ends in 2017. He’s, at the very least, a TE1 this week. Agholor has averaged 7.8 targets per game across his last nine games (including postseason). This week he gets set to face a Buccaneers secondary we had ranked as our second-worst and who just lost Vernon Hargreaves to IR and have fellow starter Brent Grimes questionable. Hargreaves was the team’s starting slot cornerback, which is where Agholor ran 53 percent of his routes last week. In five games without Kelvin Benjamin and Greg Olsen last year, Funchess totaled 39 targets, 405 yards, and four touchdowns. He gets a lofty bump up to the borderline WR2-range with Olsen out this week. Funchess disappointed last week with a 3-41-0 line on five targets. However, that looks a good deal better when considering QB Cam Newton attempted only 26 passes and Funchess had a league-high four targets called back due to penalty. Cole disappointed in Week 1, drawing just three targets (tied for fifth-most on the team). He may eventually prove to be the team’s clear WR1 but I’m not seeing it this week, with him projected to be shadowed by New England’s Stephon Gilmore. Of 120 qualifying cornerbacks last year, Gilmore graded 11th-best in 2017. Fitzpatrick was fantasy’s top-scoring player in Week 1, but I still have him ranked as a mid-range QB2. We’ve seen him go nuclear in random spots before, but I think we have a large enough sample to know it’s unlikely Fitzpatrick keeps that going for much longer. Add on the tough matchup against Philadelphia and I think he’s still too risky to start in Week 2. If Goodwin plays in Week 2, I suspect him to be shadowed by Darius Slay – one of the best shutdown shadow cornerbacks in the NFL. He’ll also be less than 100-percent dealing with a lower body injury (thigh) that will likely rob him of his most valuable asset (his 4.24 speed). All in all, he’s far too risky for me to start this week. Carson played on 26 of the team’s snaps while totaling seven carries and four targets. Rookie RB Rashaad Penny was right behind him, playing on 25 snaps and drawing seven carries and five targets. After Week 1, head coach Pete Carroll said “Carson has taken the lead.” That may be true, but it’s still going to be a low-upside committee situation. I have Carson as a borderline RB3 this week in a tough matchup at Chicago. Hogan was a non-factor in Week 1, totaling just 11 yards on five targets. If you drafted him, it’s too early to panic, but it’s also still too early to start him. He has very little upside this week in Jacksonville up against Jalen Ramsey (our highest-graded cornerback last year) in shadow coverage. Unlike with Hogan, if you drafted Watkins, it might be time to panic. Watkins has shown zero rapport with new QB Patrick Mahomes. Dating back to preseason, Watkins has run a route on 97 percent of Mahomes’ dropbacks (77 of 79) but totaled just 36 receiving yards (only 5.7 percent of Mahomes’ total passing yards). With WR Doug Baldwin out for Week 2, more targets should be funneled Lockett’s direction – but there’s more to it than that. Lockett ran 15 of 21 routes from the slot once Baldwin left the game, running 20 of 39 routes against Chris Harris Jr. (one of our 20 highest-graded cornerbacks in each of the past seven seasons). His matchup, if in the slot, should be much softer this week, up against a Bears defense that ranked bottom-10 in fantasy points per target allowed to slot wide receivers last year and who just let up 27.3 fantasy points to Green Bay’s Randall Cobb in the slot last week. In the 2.25 quarters Jacksonville was without Leonard Fournette last week, Yeldon saw all 13 of the team’s running back carries and all five of the team’s running back targets. If over a full game that extrapolates to 23.1 carries and 8.9 targets. If Fournette is out for Week 2, Yeldon is a rock-solid high-end RB2 against the Patriots. Ryan Fitzpatrick has been far more beneficial to Tampa Bay’s wide receivers than Jameis Winston ever was, as shown here (and why, here). Godwin played on 70 percent of the team’s snaps in Week 1 and saw just four targets but posted a 3-41-1 line. If DeSean Jackson (concussion, shoulder) is out for Week 2, this would push Godwin into the high-end WR3-range. The Jets attempted just 21 passes in Week 1, and Enunwa was targeted on a hefty 10 of those. Yeah, I don’t care that Jermaine Kearse is coming back this week, that’s enough to push him up to the low-end WR3 range. The matchup doesn’t hurt either, up against our sixth-worst ranked secondary. As alluded to above, I think the Rams will be a dream matchup for tight ends all year. Seals-Jones, who ranked fourth among tight ends in expected fantasy points and ranked sixth in target market share (17.6 percent) is no exception. With Davante Adams dinged up with a shoulder injury and likely to be shadowed by top shadow cornerback Xavier Rhodes, I like Allison’s chances of posting fringe-WR3 numbers this week. (We know QB Aaron Rodgers typically neglects his wide receivers in tough cornerback matchups.) Allison played on 70 percent of the team’s snaps and posted a 5-69-1 line on seven targets. I’d bet he surprises this week, even against a tough defense and with Rodgers less than 100 percent. He’s a fringe-WR3 this week. RB Matt Breida saw the majority of first-team reps in practice last week, but beat writers expect that to shift more in Morris’ favor in coming weeks. Morris did have an untimely goal-line fumble in Week 1 but he also out-snapped the other running backs (36 to 31) and out-carried them (12 to 11). He also dominated near-end-zone work, ranking second among all players in expected touchdowns. Though risky, the matchup, as 6.0-point favorites at home against Detroit pushes him into the mid-RB3-range. Lindsay may have been the most sought-after commodity on your waiver wire but that doesn’t make him a “start” for Week 2. He spent the majority of camp working as the No. 3 running back and then saw a near-even split with Royce Freeman in Week 2. The matchup is good, but both the ceiling and floor are low, while stuck in a committee with Freeman. Dissly broke onto the fantasy scene in his first career game, scoring 19.5 fantasy points on five targets. True, but 70 percent of that came on just one play and he only ran a route on 50 percent of Russell Wilson’s dropbacks. Right now, I doubt he’s worth rostering, let alone starting. Richard posted a big game in Week 1 but I think this more of an aberration than anything to expect in Week 2. Richard benefited from negative gamescript, a mysterious Marshawn Lynch illness, and a defense that funnels targets everywhere but to wide receivers. I have him as a fringe-RB4 in PPR leagues for Week 2. Buffalo totaled just 98 passing yards in Week 1, and to make matters worse, Clay has a brutal matchup this week. He faces a Los Angeles Chargers defense that just held Travis Kelce to six yards on six targets in Week 1, after ranking second-best in schedule-adjusted fantasy points allowed to tight ends last year.